Monday was the day Maria and I have been waiting for. 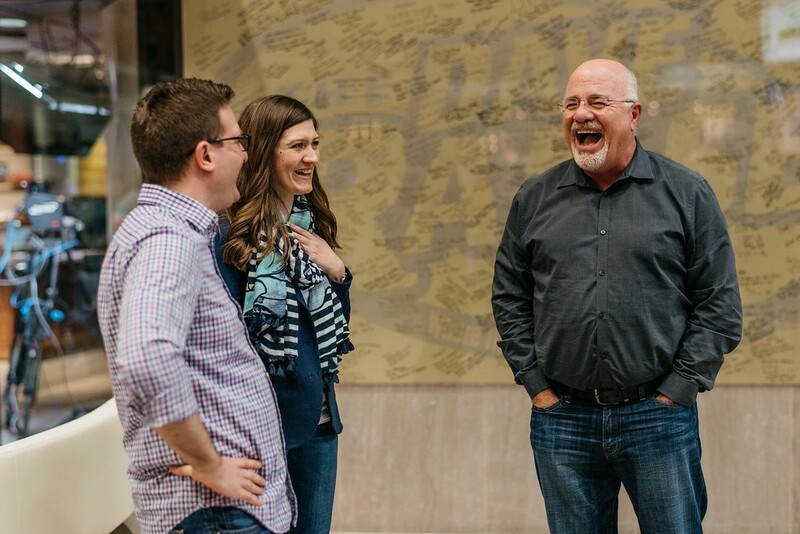 The day we got to go on the Dave Ramsey Show and do our Debt Free Scream! We practiced on our drive down to our long weekend in Nashville and again in the space of our rented bungalow in East Nashville (that time with Maria's iPhone recording so we could watch and critique our performance) just so we could be sure to get it right. I'm sure glad we did because even I got a little nervous knowing that my words were being broadcast all over the country at that moment. 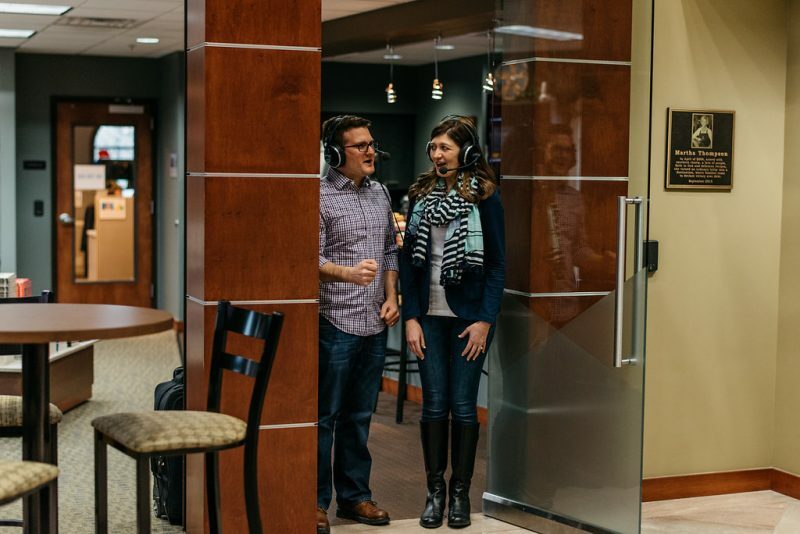 But I'm getting ahead of myself, let me walk you through our Debt Free Scream experience. 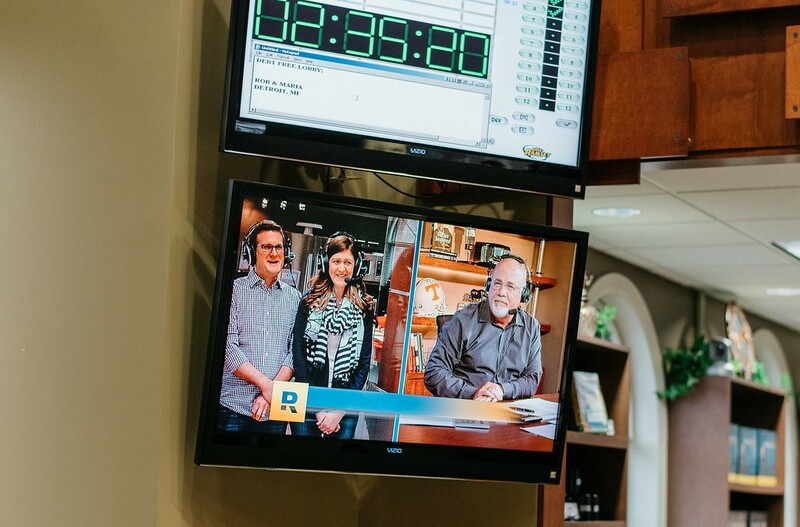 The Dave Ramsey Show is aired from a studio the first floor of Dave Ramsey's main building. Right when you walk in, you can see a big sign announcing that you have arrived in the right place. 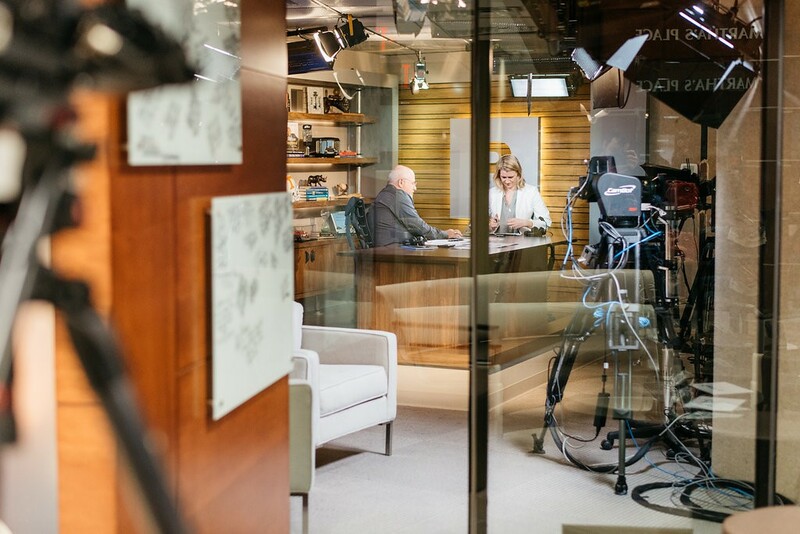 Beneath the sign is a window right into the studio, so you can watch Dave as he hosts his show, interviews guests and talks to callers. Directly across from the studio is Martha's Place, a little coffee shop that serves free coffee and treats to visitors, as well as selling many of Dave's books and resources. 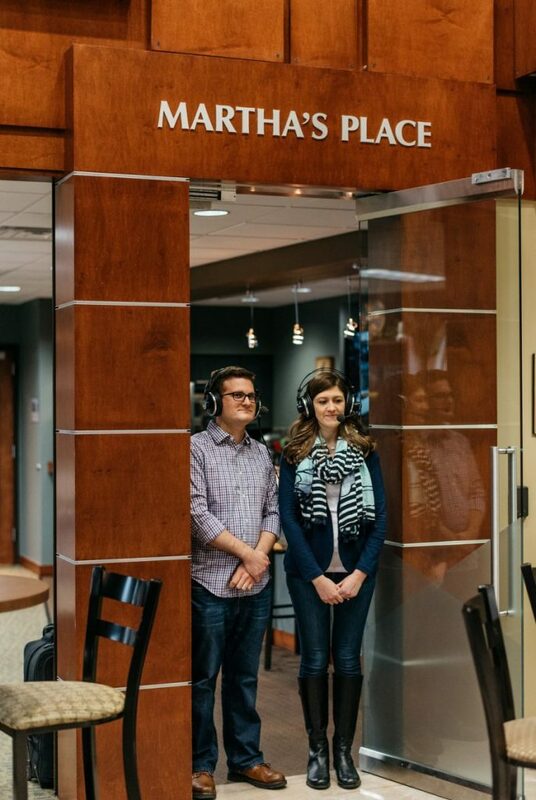 You can actually see the words “Martha's Place” reflected in the studio window in the upper right corner. The lobby is always abuzz. 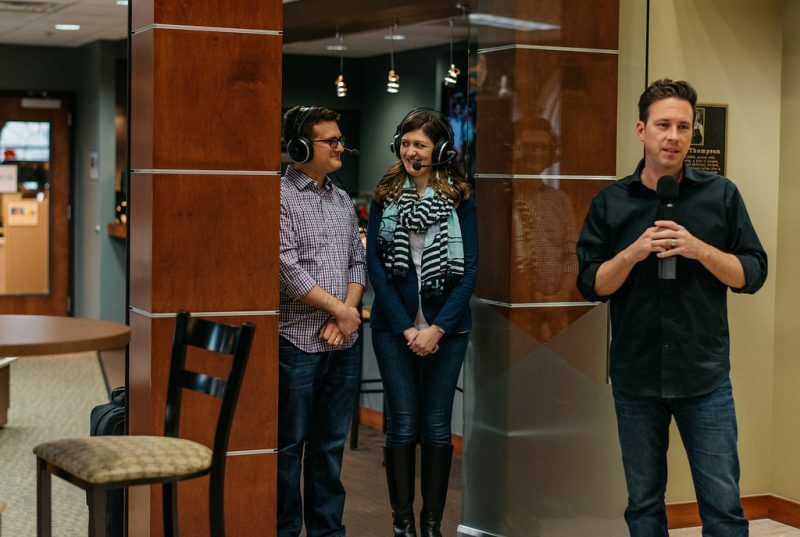 Some guests come to scream “We're Debt Free!” and others come to meet Dave, see the studio and watch the Screams. 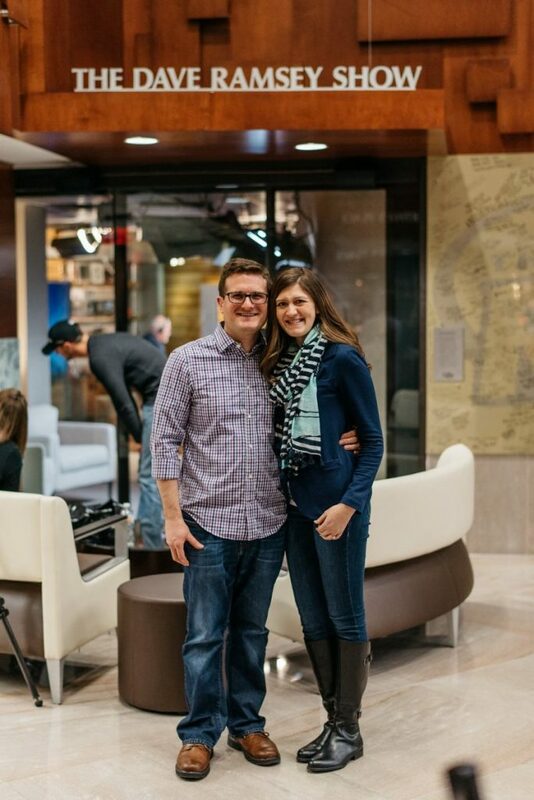 When Maria and I arrived at the studio, the first couple of the day was just starting their Debt Free Scream. We talked to them afterwards and instantly connected. 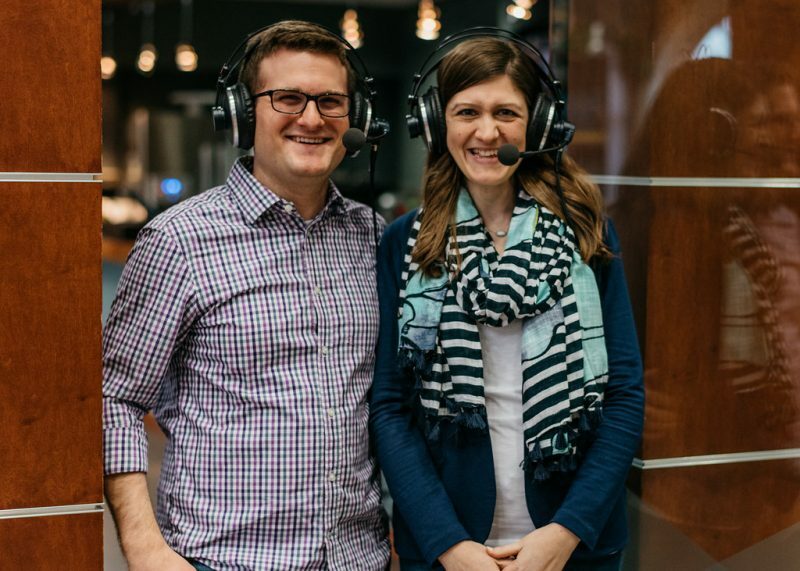 They were Scott and Addie, who had paid off $63,000 in 20 months. 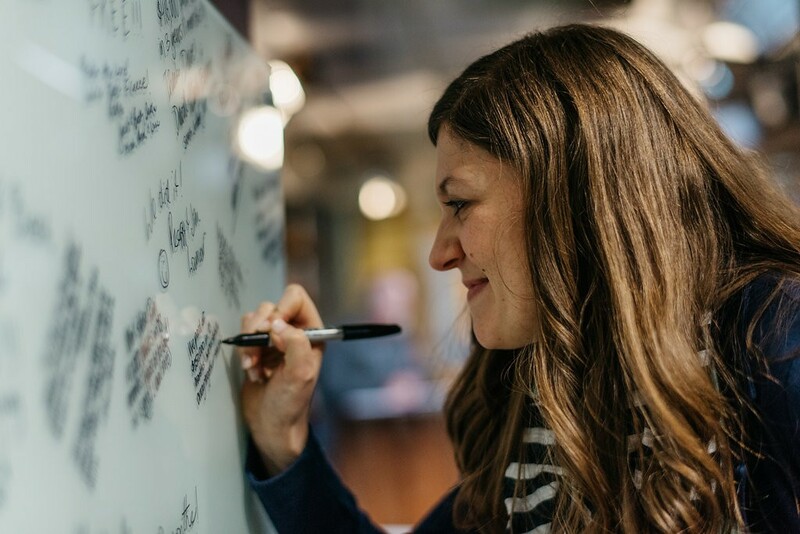 Imagine Maria's surprise when she learned that Addie was also a fellow Stitch Fix addict! 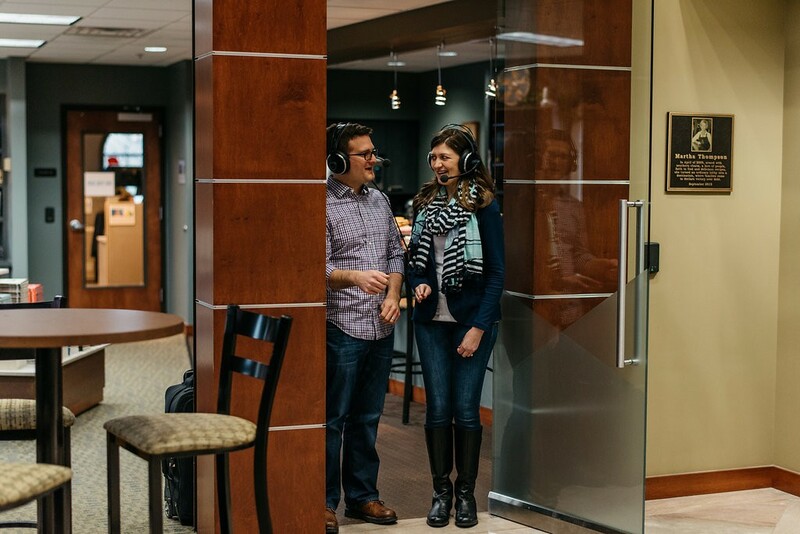 During the broadcast, Dave will occasionally come out of the booth into the lobby to meet with people, sign autographs and just say hello. 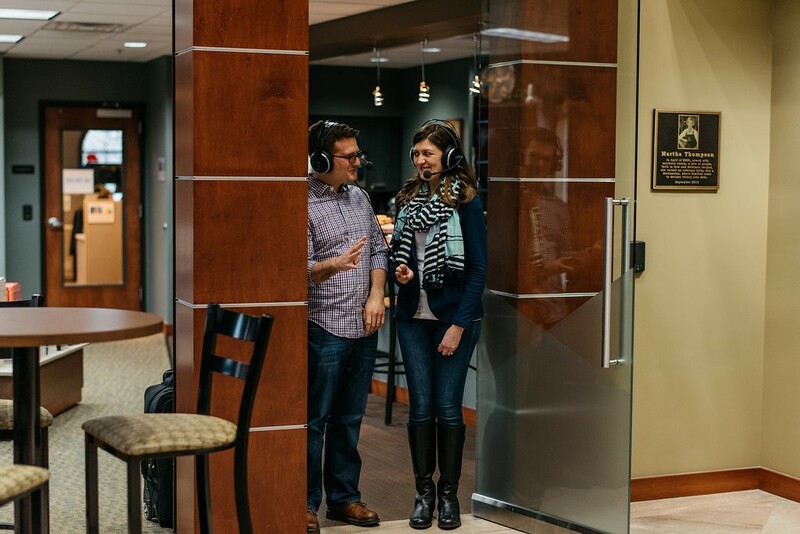 Maria and I marveled at how he just bounced from broadcasting, to meeting five people rapid fire in the space of a couple minutes, and then heading back into the booth to resume broadcasting. The man is seriously focused and is “on” for every moment of his three-hour radio show. Even though our Debt Free Scream wasn't for another forty five minutes, we couldn't resist the opportunity to meet the man himself! 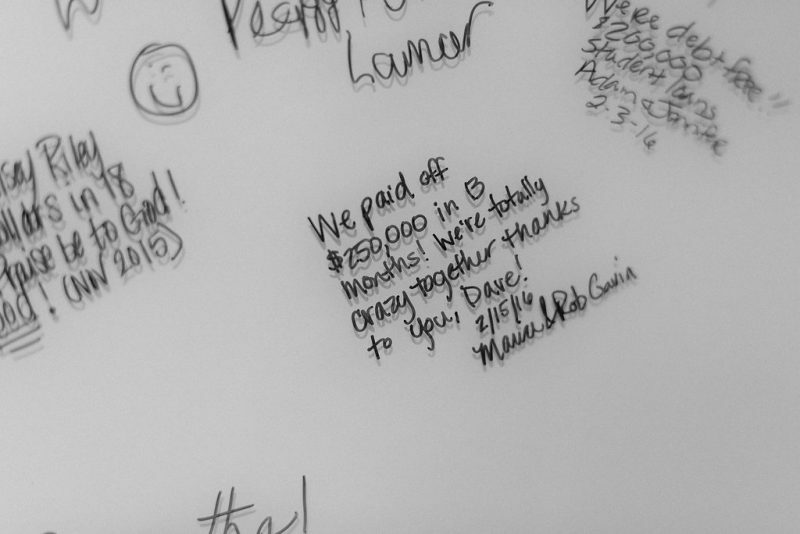 Maria got out our Debt Free Chart and brought it over to show Dave. He loved it! We took a picture with him holding it up and then asked him to sign it. If you are on your own debt free journey and want to visualize your progress, Maria made a customizable version of the On Our Way to Debt Free chart that you can download by clicking on the image below. 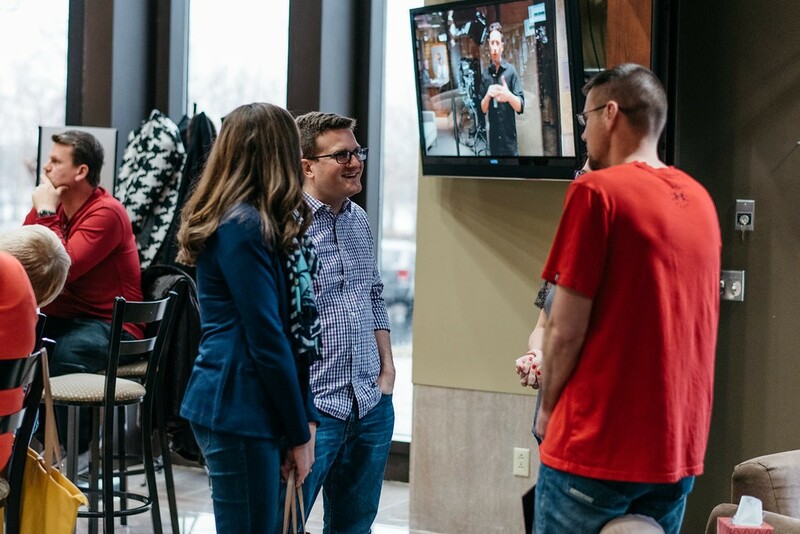 I must say, in the couple minutes we spent with him right there, you could tell that he was a genuinely outgoing, personable and kind-hearted man. 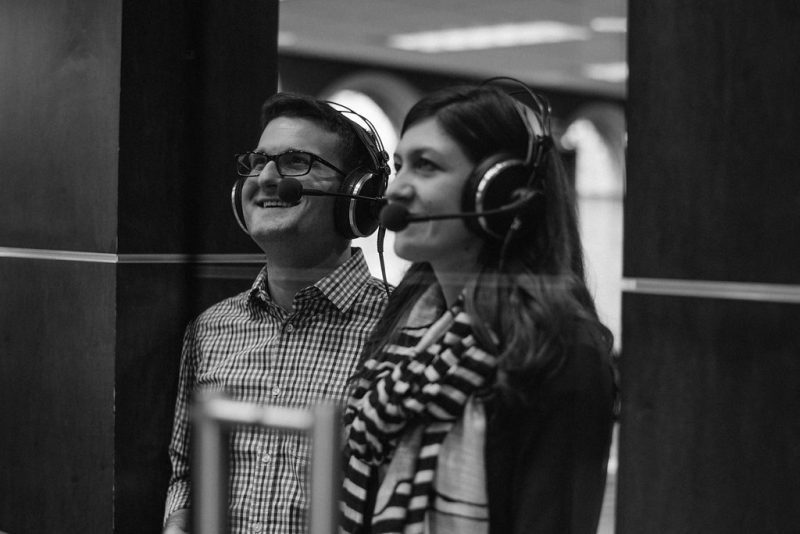 We were even more excited to do our on-air interview and Debt Free Scream now! 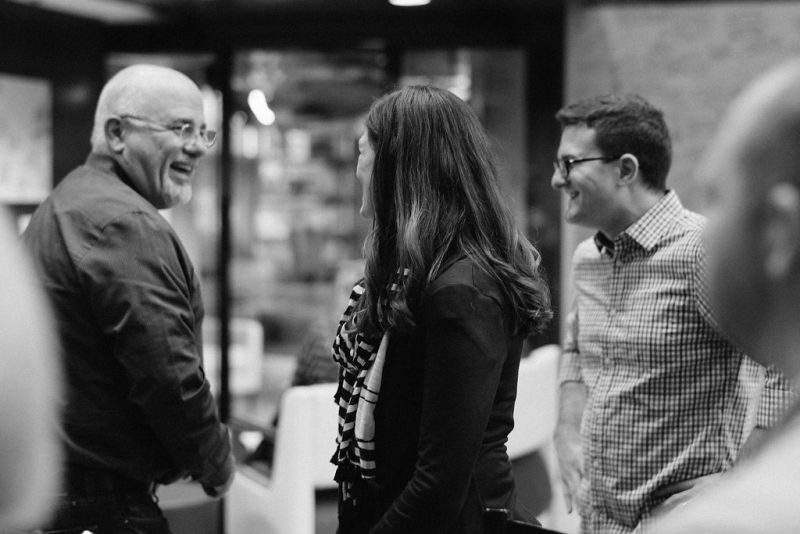 After talking with Dave, we headed over to Martha's Place to enjoy a cup of coffee. While there, we spoke with Dorothy, who runs Martha's Place now that Martha is retired. Dorothy was a lovely lady with a fascinating story of her own. 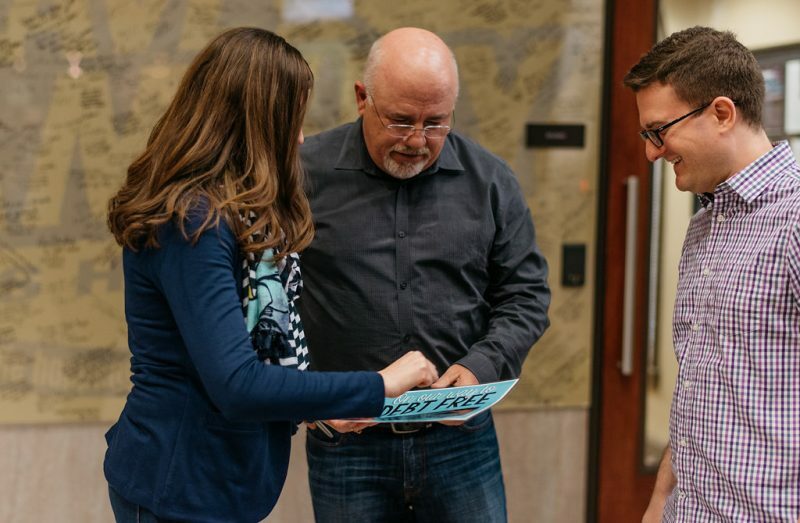 She and her husband had been Dave Ramsey fans and FPU coordinators for many years. 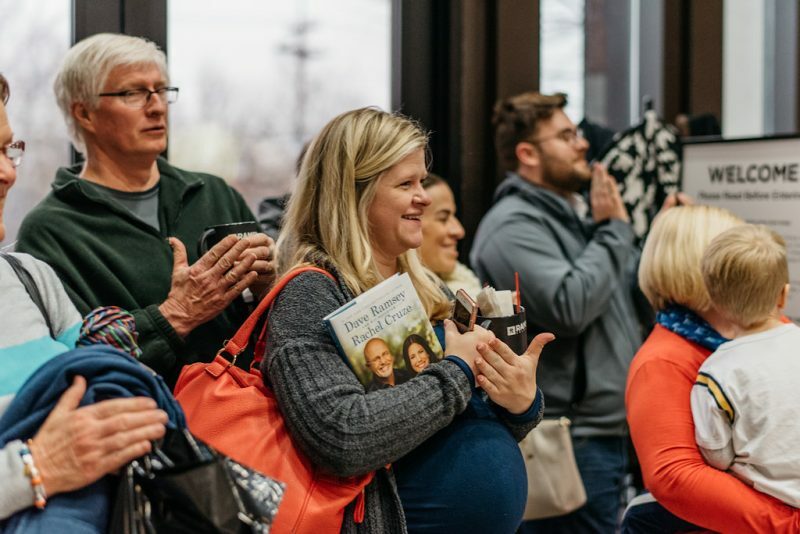 When Martha retired and her job opened up, Dorothy's husband encouraged his wife to apply for the job, even though they had to move out of state for her new employment. Talk about dedication. Finally, after all our waiting and nervous anticipation, it was time for us to get ready. Kat is the person who gets the Debt Free Screamers set up and ready to go on the air, as well as managing the crowd of people in the lobby during the show. She brought us over to the door in Martha's Place where the Screamers stand, gave us our headsets and walked us through what would be happening. First, we had to wait for the commercial break to finish up. While that was happening, the camera got set to record our Scream. Then an announcer (Ken Coleman) came out to record a little teaser. 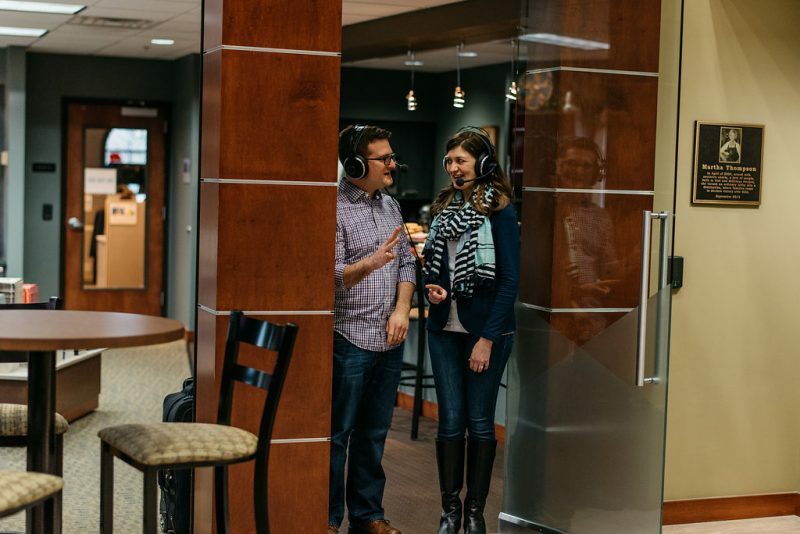 The funny thing for Maria and I (which is why we are looking at each other like we have an inside secret) is that all this was going on and we could not hear a darn thing with those headphones on. We had no idea what was going on, what Ken was saying, nothing. 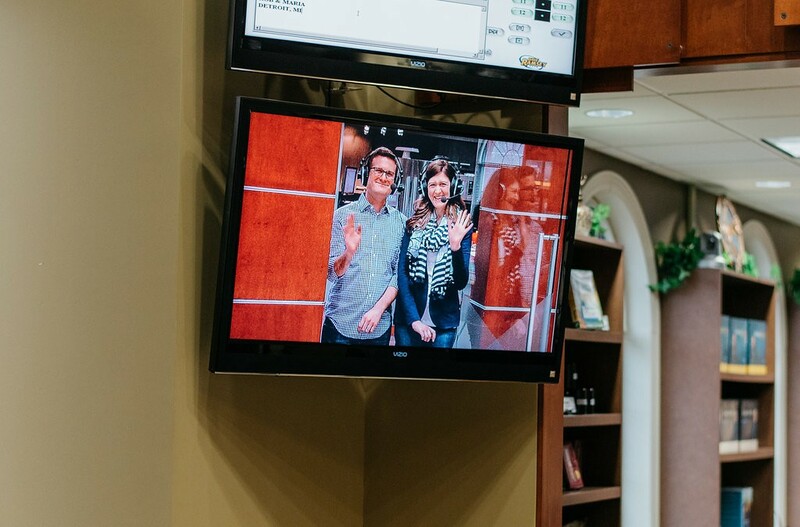 We didn't even know that our pictures were being broadcast on the TV in the lobby. And then our interview with Dave started. I'd say it was just like any test I've ever taken. You get more nervous as the test gets closer, no matter how much you study for it. But then the teacher tells you to flip your test over and get started, you just do it. Nerves are gone and you put the pen to paper and start writing. Dave was great. He was really easy to talk to. And, heck, this was our story. It's not like we haven't told our story a whole bunch of times. We're used to it at this point. So, we just talked. About how much debt I had and how I got into it. 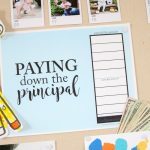 About how we sold my house to help pay it off. And how Maria put her savings toward my student loans. And the excitement of making that final payment. And everyone watching in the lobby clapped and cheered along with us. Oh, heck, why am I describing this when you could watch it? 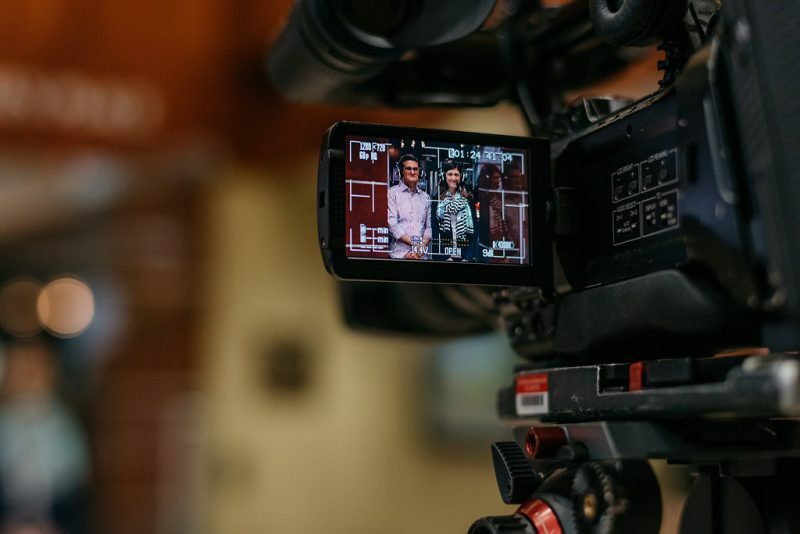 If a picture is worth a thousand words, a video must be an entire novel. Click the image below to see our interview with Dave and Debt Free Scream in their entirety! Maria and I love re-watching that video almost as much as we love watching our wedding video. What an experience this whole thing was. 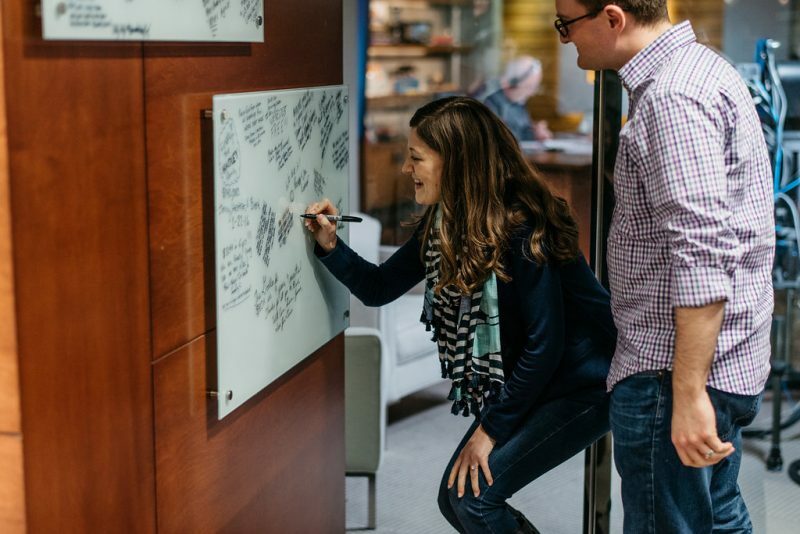 After our Scream, we stopped by the wall to sign our names along with so many other people who have reached their debt free goal with the help of Dave Ramsey. 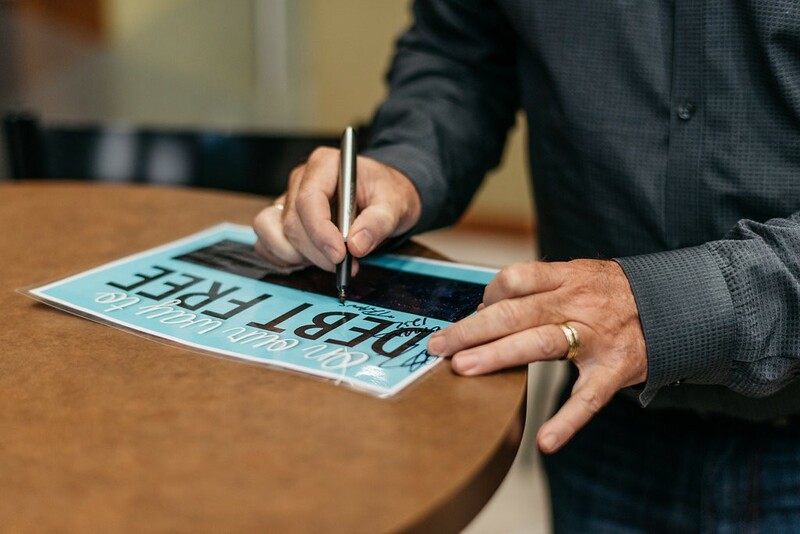 Apparently, there are so many people who have signed the wall, that they now have smaller pieces of plexiglass for people to sign and, when they're full, they put up a new piece of plexiglass and display the full one somewhere in Dave's offices. At the next commercial break, Dave came out again to meet with us, congratulate us, and share a joke. I can't stress enough how nice a guy he was. We truly had a great time. 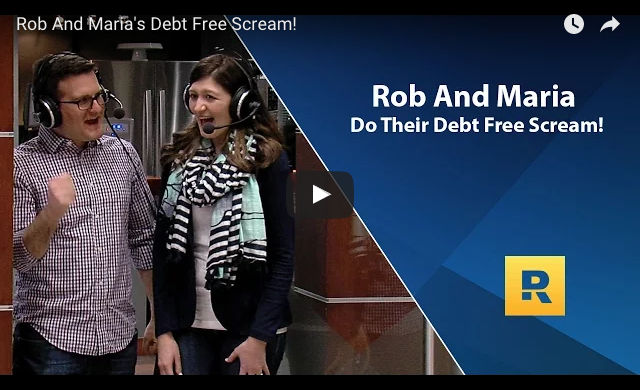 Going on The Dave Ramsey Show and doing a Debt Free Scream was like nothing Maria and I have ever done. Thanks so much to Jodi Southard for giving Maria (and thus me) the kick in the pants to apply for the Debt Free Scream, it was well worth it. We had a blast and it was a good excuse for a little vacation. As a fun surprise, we decided to post a clip from one of our practice videos (yes, we did it more than once). We recorded it on Maria's iPhone in our Airbnb room while our host was downstairs, so we tried to be quiet so she didn't think we had completely lost our minds. It's a good thing we practiced because it took a few tries before we were finally able to get our numbers straight, as you'll see in the video. I hope you enjoy Maria's impersonation of Dave as much as I did! 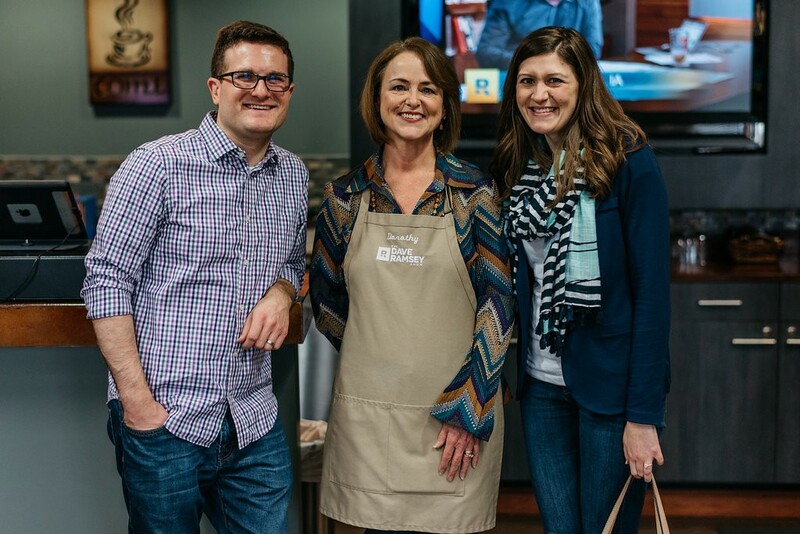 We would like to thank Cody Harris of Cody and Allison Photography for taking these wonderful photos of our time on The Dave Ramsey Show. 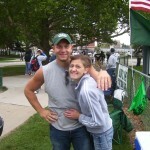 Cody was a pleasure to work with and, as you can see for yourself, quite talented. Also, fun fact, Allison is Cody's fiancé and Maria and I have special places in our hearts for couples that run a small business together. If you're looking for photographers in the Nashville area, Maria and I highly recommend that you check out Cody and Allison. 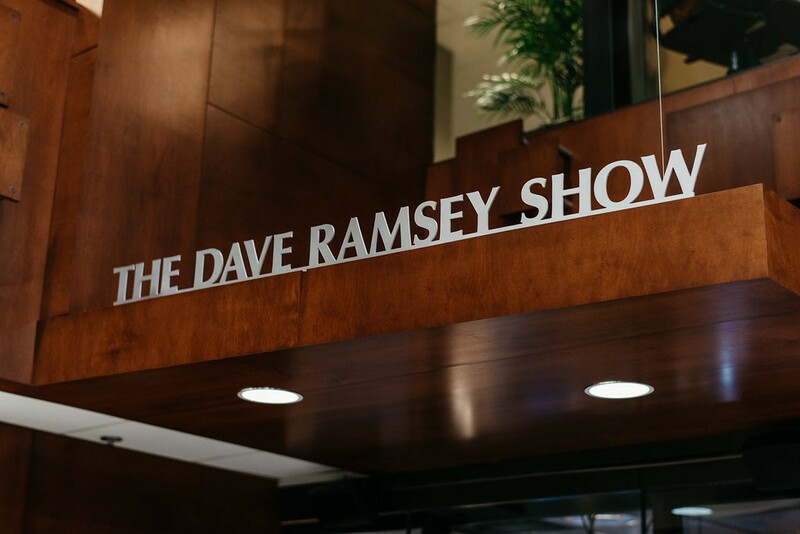 Our experience on The Dave Ramsey Show is one we will not forget. It's quite a journey we've been on so far and we can't wait to see what our debt-free future has in store for us. 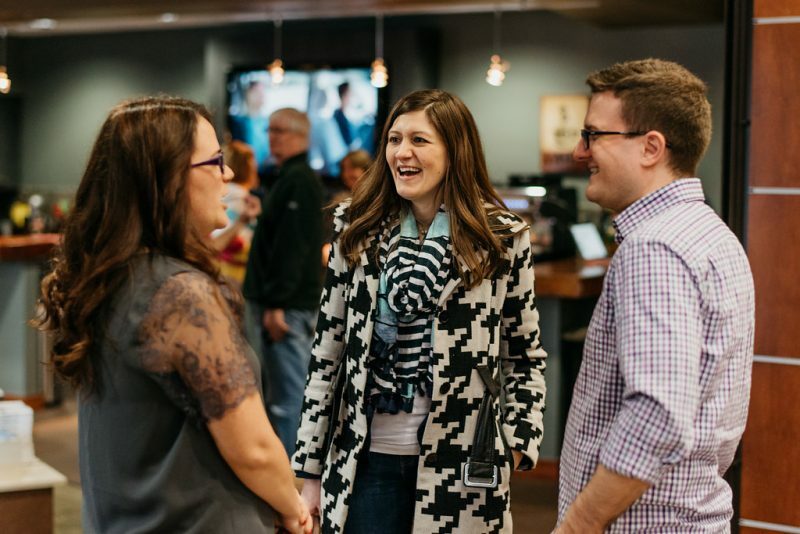 You can read more about our journey out of debt by clicking on any of the images below. 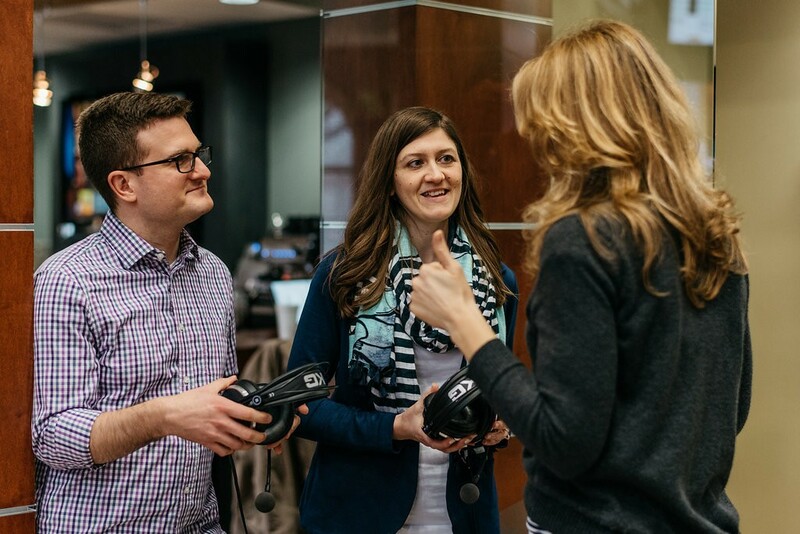 LOVE the idea of a professional photographer documenting this experience for you! Great thinking. Did you disagree at any point? 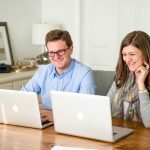 What advice do you have for other couples starting out (most who aren’t marrying someone with a pile of cash saved up!)? I’ll take a stab at answering some of those. Maria may have some different thoughts, though. Hardest part: as far as sacrifices, I was never a big spender. Probably the biggest change for me was eating out a LOT less. I started packing lunches or going home for lunch and, when I did go out, opted for something a little more affordable. Disagreements: not on anything major. 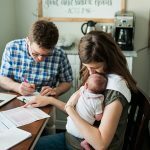 It did take me a little bit to come around to renting rather than just buying a new house, but it wasn’t like we had a fight about it or anything. 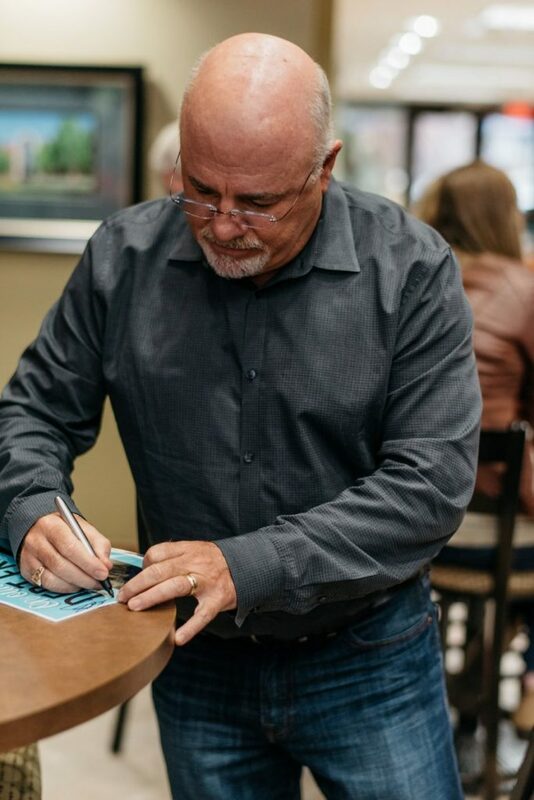 Once I realized that getting out of debt was the priority, I made the mental shift needed to renting. 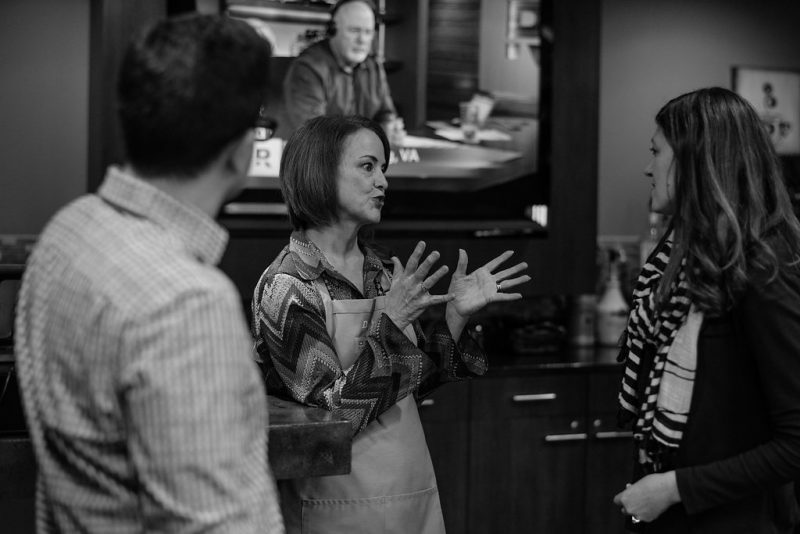 Advice: do FPU together. Seriously. I mean, Maria’s savings changed what we would have done otherwise, but we would have just stuck with Dave’s plan if we didn’t have that savings. We would have worked our butts off to pay that debt off through the debt snowball and gotten there, it just would have taken much longer. I love this post. Maria’s Dave impression is great. Thanks for the shout out! Loved meeting you both. Thanks and you’re welcome! It was wonderful meeting you both, too! Keep in touch! Can you post how you made your chart? 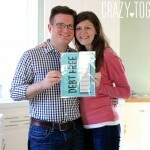 Maria made it available as a free download in PowerPoint in this post: https://crazytogether.com/dealing-with-debt-our-story/ Enjoy and good luck! I am so proud of you two! 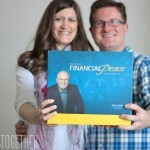 My husband and I have been through FPU as well. We have been married for 25 years and are happy to have paid off our home 10 years ago. It is so worth it! Thanks! 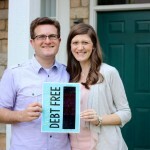 We’re looking forward to owning a home debt free, too. That’s the next goal. 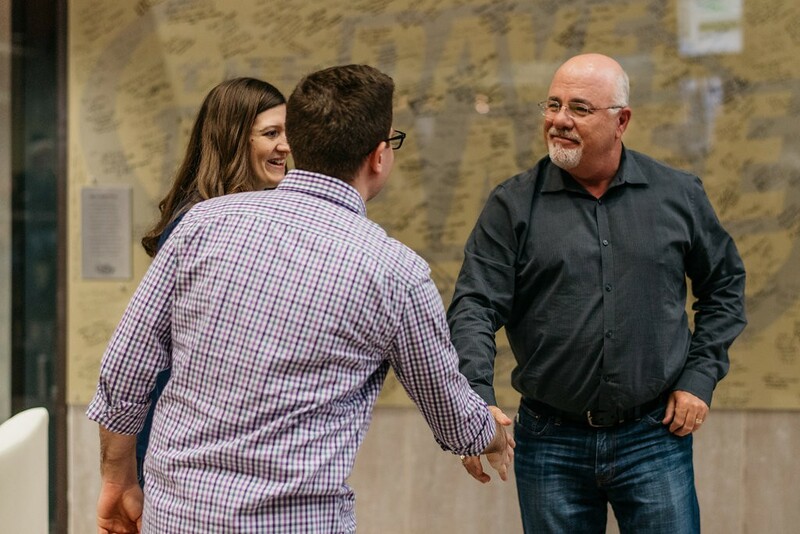 I love all things Dave Ramsey stands for. I always get the biggest smile and teary eyed with debt free screams and yours was no exception, especially being a blog reader of yours. Once I was working from home on a snow day listening to Dave’s show and I couldn’t help but pay off one of my student loans that moment and have a mini scream of my own. 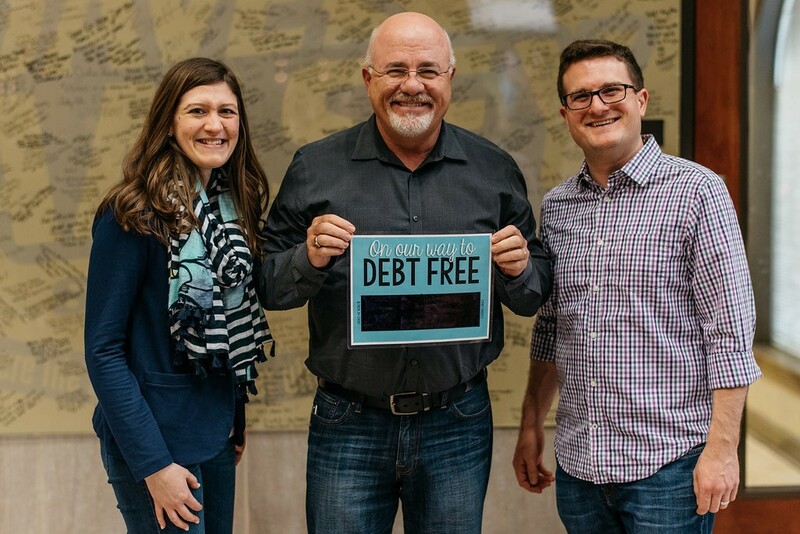 Debt free is true freedom! I had a dream recently that I got away from the office to ask Dave a question at a meet and greet but everyone kept skipping line in front of me and he let them. I’m so glad (and I know) that he’s great to meet. Your professional photographer idea was great too! Congratulations! Thanks, Emily! That must have been some kind of dream. Not quite a nightmare, but a strange one to have. What a great experience! 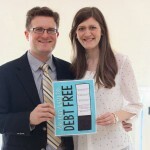 I am working toward being debt-free also. You guys are an inspiration. Thanks! 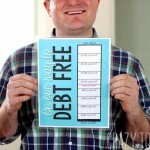 Good luck with your debt-free goals! So Awesome! What a great experience & what a great example you guys are to others. Congrats! Congratulations, y’all!! What an exciting moment for you two. 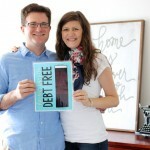 Reading this blog has inspired my husband and me to become debt free as well. Thanks for putting it all out there! Luckily we caught on to Dave’s steps early before we accrued an inordinate amount of debt. Truly, we have y’all to thank for that. Congrats and thank you again! Wow, we’re so happy that we were able to help you! Thanks for the wonderful comment and the congratulations! Congrats!!! I loved watching your Debt Free Scream! I paid off about 17k in the past 18 months with another 17k to go before I am debt free. Thankfully, my fiance is on board with Dave’s plan! That’s great! Keep up the good work with gazelle intensity! 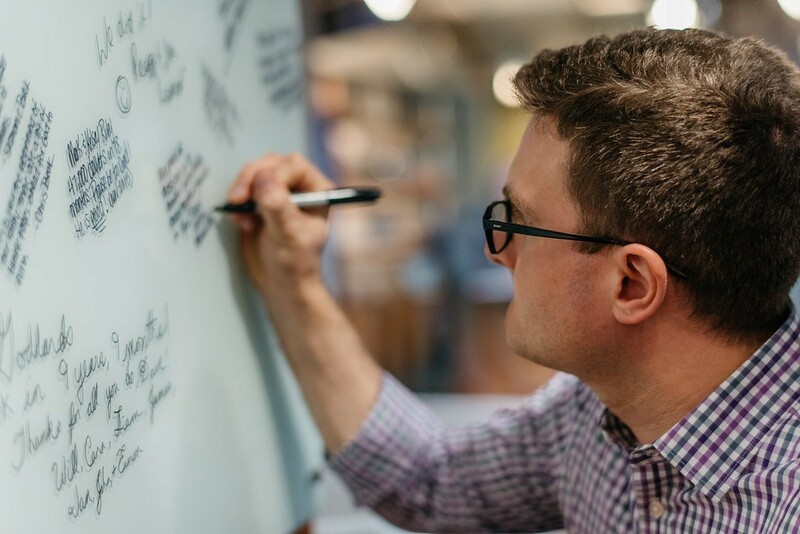 Thanks for reading and following along with our journey, too. 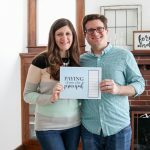 My husband and I have been doing dave’s plan since October! I am also starting whole 30 tomorrow! Send positive vibes our way! 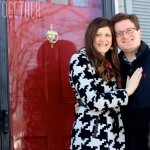 I found your blog and am so happy I did! Great inspiration! My motivation had fallen the past 2 weeks so I am glad I found this today! This article gave me the chills. Thank you for the inspiration. 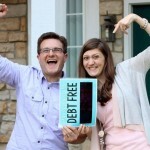 Enjoy your debt free life! Thanks! We are loving it!